Be sure the cart you choose is strong enough and large enough to hold the AV equipment you need to store or move. The monitor size is a good place to start. Measure your monitor diagonally, from the upper left corner of the screen to the lower right corner of the screen. We list the maximum screen size for AV carts in the specifications section of each product page. Will your projector or monitor be used with elementary school students or high school students? Both? Your audience is one thing to consider when shopping for an AV cart. Some AV carts have adjustable height so you can accommodate the needs of older and younger classes; others have a fixed height. It is best to keep very large and heavy equipment balanced and closer to the ground to cut down on the risk of the equipment falling and causing injury. Also, the larger the room, the higher you'll usually want the monitor. 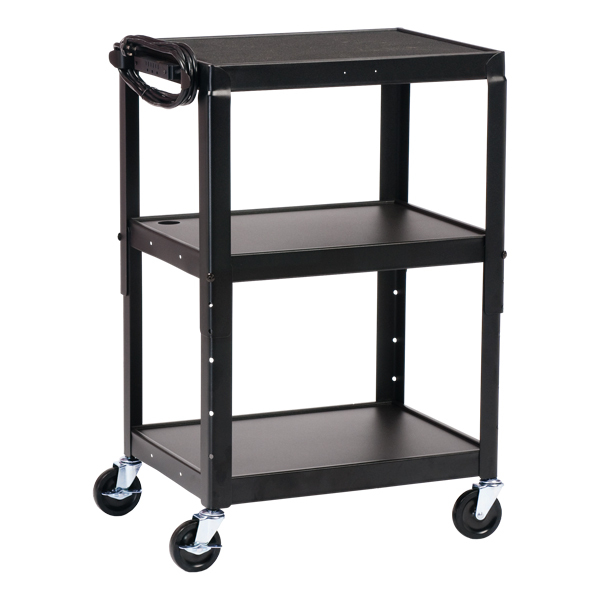 Most AV carts feature plastic or steel frames. Plastic carts are usually lighter, less expensive and slightly weaker than steel carts. The rule of thumb is that the larger and heavier your equipment, the more likely it is that you'll need a steel AV cart. 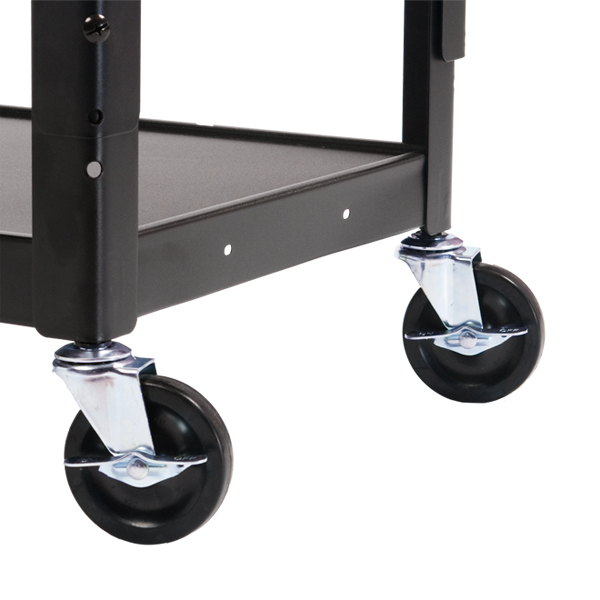 Most AV carts have some sort of swivel casters, and they can range in size from small dual-wheel plastic casters to sturdier 5-inch casters with locks. Some carts that must hold very heavy loads, are pushed over rough ground or need to be maneuvered in very tight areas may work best with bigger wheels. Several of our AV carts are available with semi-pneumatic wheels. These wheels provide the smoothest ride, but they usually come at an additonal cost. Semi-pneumatic wheels are made of hard rubber and do not need air. It's a good idea to think about the size of the items that you will be storing and moving before buying an AV cart. Does your AV equipment have several pieces that require numerous storage shelves in addition to the top surface? 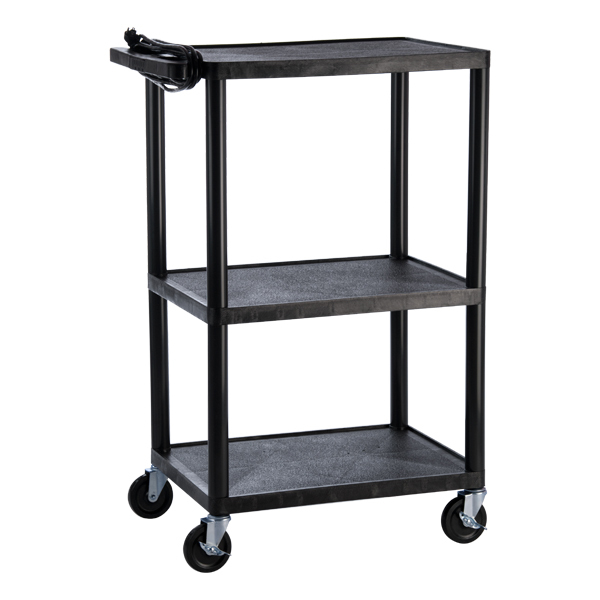 Carts with adjustable shelves are usually a good choice because they allow you to store a variety of different supplies and equipment. Some AV carts have storage cabinets where you can lock away your expensive equipment after class is over. These cabinets usually feature heavy-gauge steel construction for extra safety. Some AV carts come standard with a power strip; others have a power strip option that comes with an additional charge. Power strips cut down on the number of cords that you need to run from the equipment to the wall outlet. Browse our entire selection of AV Carts to find the cart that's right for your needs. Still not sure which one is best for your classroom? Give us a call at 1-800-260-2776. A friendly member of our sales team is ready to answer questions and give advice.